A lifestyle medicine evidence review was conducted by the American College of Preventive Medicine in 2009. It compiled the scientific evidence that supports the need for increased competence in lifestyle medicine among healthcare providers and predicted an increased demand for training in delivering lifestyle interventions. It argued that greater provider competence might lead to improved patient outcomes. 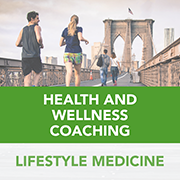 Healthcare practitioners new to health and wellness coaching require training in both its science and practice to successfully offer this service to their patients. Current methods for promoting health behavior change often fall short in motivating individuals to engage in healthy habits. When practitioners gain both motivation and confidence in working with patients they are better able to apply effective coaching skills. Participants in this education activity will be able to impact their practices by introducing health and wellness coaching into their practices, and training their staff to build better relationships with their patients, improve their patients’ engagement in behavior change, and improve patient outcomes with sustainable health behavior changes.